Truth be told, my favorite thing to bake around the holidays is the leg­endary rum cake, a recipe my Blue Bird leader, Mrs. Viste, gave to me when I was in her flock some 30 years ago. The much-loved recipe card, now taped to the inside of a cupboard in my kitchen, has been used so much you can hardly make out the measure­ments or ingredients anymore. Drips of butter and rum have smudged out the writing. Not to worry, I practically can make a rum cake in my sleep by now. I do love the way you can dump all of the ingredients into the blender, whir it together, spray the Bundt pan with floured baking spray, pour in the batter and shove it in the oven, knowing with­out a doubt it will come out perfect every time. That’s my kind of recipe. That said, try as I might, I have been unsuccessful in uncovering any inher­ent health benefits of eating butter, sugar or rum. Which brings me to the walnut. If you’re looking to add a superfood to your diet, this may be just the nut for you. Rich in fiber and a good source of protein, walnuts also contain omega-3 fatty acids that are known to lower bad cholesterol. In addition, integrating walnuts into a healthy diet helps pre­vent heart disease by strengthening blood vessel elasticity and reducing plaque in blood vessels. 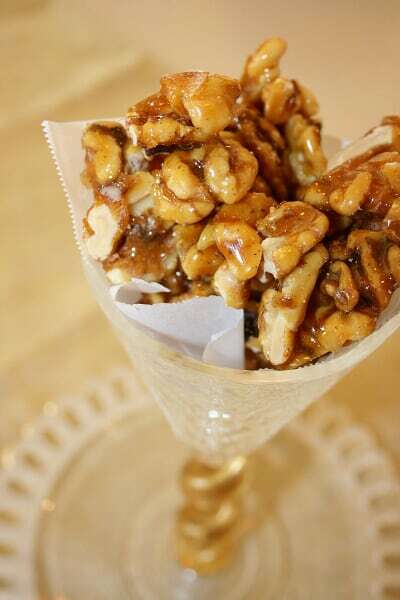 Here’s a great way to make some­thing special out of walnuts and share it with your friends. Lightly toast some walnuts, melt some sugar, caramelize the walnuts and add a bit of sea salt and a dash of cayenne pepper, which incidentally helps to stimulate circulation and pro­mote healing in the body. Voila! You’ve got Candied Cayenne Walnuts, which wrapped up in a cellophane bag and tied with a festive ribbon, makes a love­ly hostess gift. Add a bottle of bubbly, and it’s a cocktail party waiting to happen, and who wouldn’t appreciate a gift like that around the busy holiday season? Blueberries provide another host of curative fixes to the body, improving memory and brain function and help­ing to prevent and fight cancer, to name just a few. Whip up a batch of Blueberry Oat Scones, and you have a wholesome breakfast treat to share with a friend. Tuck a tin of fancy tea into the bas­ket of freshly baked scones, and it’s breakfast in bed, a much-appreciated present for friends hosting out-of-town guests for the holidays. It does sound too good to be true, but eating dark chocolate, a powerful antioxidant, in moderation, can help lower blood pressure and fight heart disease. Make the Bittersweet Choco­late Sauce once, and you might be hooked. With just three ingredients, it’s easy to stockpile the staples and whisk together this smooth and silky choco­late sauce at any time, in no time at all. Warmed briefly in the microwave, the Bittersweet Chocolate Sauce is a perfect pairing with peppermint ice cream. Or pick up some cream puffs and fresh strawberries, and you’ve cre­ated a fondue party kit most anyone would love during the holidays. Don’t get me wrong. I’m definitely not giving up the rum cake baking this year. I’m sure I will have occasion to bake a few of the tried-and-true treats throughout the holidays. It is gratifying making my new holiday gift foods with health benefits, knowing I’m spreading the gift of good health as well as Christ­mas cheer this year. Here’s to health, and happy holidays. Preheat oven to 350 ° Spread walnuts on baking sheet in a single layer. Toast in preheated oven for five to eight minutes, until lightly toasted. Cool. In a medium, heavy saucepan over medium-high heat, melt sugar, stirring and cooking until completely melted (no lumps) and golden brown. Do not overcook. Add walnuts, salt and cayenne to melted sugar and stir to combine. Immediately pour walnut mixture into a 9-by-13-inch baking dish lined with buttered parchment or waxed paper. Let cool. When completely cool, flip waxed paper onto a cutting board, peel waxed paper off Candied Cayenne Walnuts and break into small pieces. Preheat oven to 400 ° . Sift flour, sugar, baking pow­der, baking soda and salt into a mixing bowl. Stir in oatmeal. Using a pastry blender, cut butter into dry ingredients until incorporated. Whisk buttermilk, egg yolks, vanilla and almond together. Stir wet ingredients into dry ingredients until just combined. Gently stir in blueberries. Roll dough out on lightly floured board to 1 inch thick­ness. 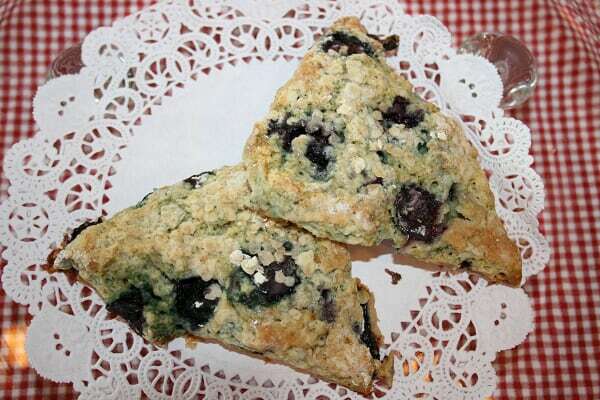 Cut scones into three-inch triangle shapes. Brush with cream (or milk) and sprinkle with sugar. Place scones on buttered and lightly floured baking sheets and bake in preheated oven for 10 to 12 minutes, until lightly browned and toothpick comes out clean when inserted in cen­ter of scone. Makes two dozen three-inch scones. (gentle boil with small bub­bles). Remove from heat and add chocolate chips. Whisk until smooth.Whisk in flavoring to combine. Pour into pint jars and let cool. Refrigerate sauce until ready to use. To use, remove lid from jar and rewarm sauce briefly in microwave. 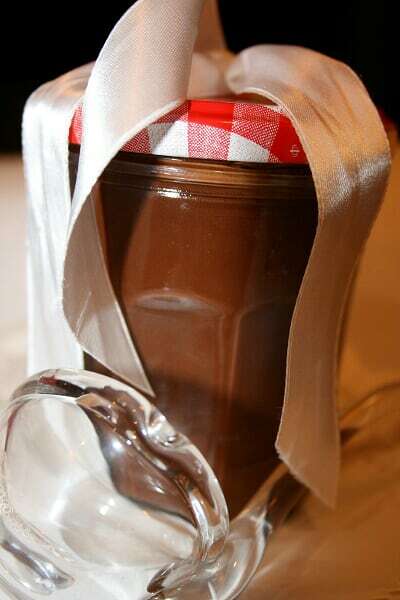 Great over ice cream or as a dipping sauce for chocolate fondue. Mix all cake ingredients together in the blender until thoroughly combined and smooth. Spray a Bundt cake pan with nonstick spray with flour. Pour batter in the pre­pared pan and bake in preheat­ed oven for 45 to 50 minutes. From the kitchen of Karyl Viste. Whats up! I just want to give an enormous thumbs up for the nice information you’ve gotten right here on this post. I might be coming back to your weblog for extra soon. Let me know what specifically you would like to include and where you would post it.